Figure 1. Complete AccuScan setup. Figure 2. Schematic layout of the open field chamber without and with the hole board setup. Testing is conducted during the light phase between 08:00 and 16:00 h. Mice are transported from the vivarium into the test room and are allowed to habituate for at least 30 min before testing. Activity assessment is conducted in 4 square arenas constructed of clear acrylic panels (see Figs. 1 and 2). Mouse activity is measured via a grid of invisible infrared light beams. A number of equally spaced beams traverse the mouse cage front to back and an equal number of beams traverse the same cage from left to right. Any movement made by a mouse within the VersaMax monitor break through these light beams. Thus revealing the mouse’s position in the (X-Y) plane. Vertical sensors monitor rearing and jumping activity. The Versamax software analyzer collects the beam status information from the activity monitor and subjects it to rapid analysis. Each time the analyzer receives the beam status, it is able to determine the position of the mouse at 50 times per second. 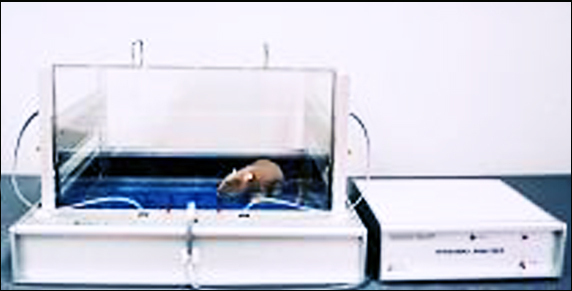 At this speed stereotypic activity, as well as hyperactivity, where a mouse transverses the entire cage in fractions of a second is readily monitored. a. Each of the 4 arenas is mounted within specially designed sound attenuating shells constructed of polypropylene and regular and expanded PVC. Besides keeping outside noise to a minimum, these chambers also keep out external light and odors. b. Before testing the VersaMax monitoring system is automatically checked and configured according to manufacturer's protocol and is illuminated with a red 7.5W light bulb. c. With the automatic tracking system turned ON, each mouse is placed in the center of the arena (Fig. 3) and allowed to move freely about the novel environment for 10 min (600 s). The VersaMax Analyzer collects the beam status information 50 times per seconds, a speed sufficient to reveal stereotypic activity and hyperactivity. e. Horizontal, vertical, stereotypical, total distance traveled, thigmotaxis, and center activity measurements are extracted from automatically recorded data. d. At the conclusion of each trial the mouse is temporarily removed from the arena, returned to its holding cage, and the system readied for subsequent hole board test. f. In between mice, the surface of the arena is disinfected with 70% ethanol. Figure 3. Mice are placed in the center of the arena. 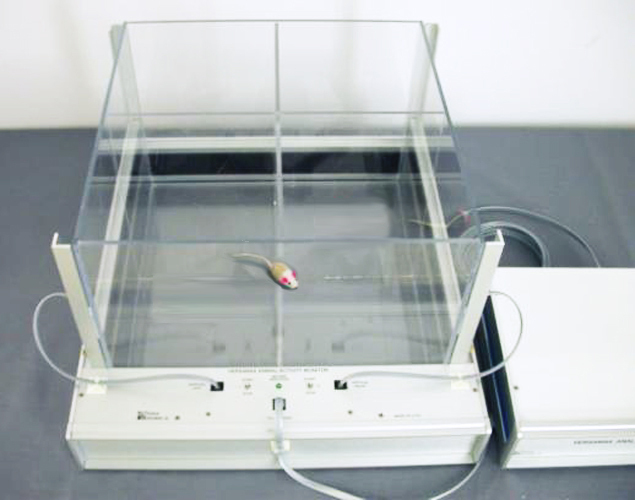 The open field system is adjusted to study hole poke/nose poke behavior using a baited or non-baited hole board placed in the standard mouse cage. Like the open field, the exploratory hole-board test is used to determine general activity levels and locomotor activity, as well as exploratory habits, and anxiety-like behavior in a novel environment. a. An elevated platform with 16 equally spaced holes is placed within the open field system according manufacturer's instruction (see Fig. 2). Each hole is large enough for a mouse to puts its head fully into the hole without being able to pass completely through to the other side. b. A tray of small food/reward cups with a removable screen is placed under each hole. Typically a small food/reward pellet is placed in each of the 16 cups. Only when a screen is placed over the cup, that the mouse is able to see and smell the food/reward, but cannot retrieve the reward. c. A designated cup is chosen as the target hole and then left uncovered, while all other cups are covered with screens. 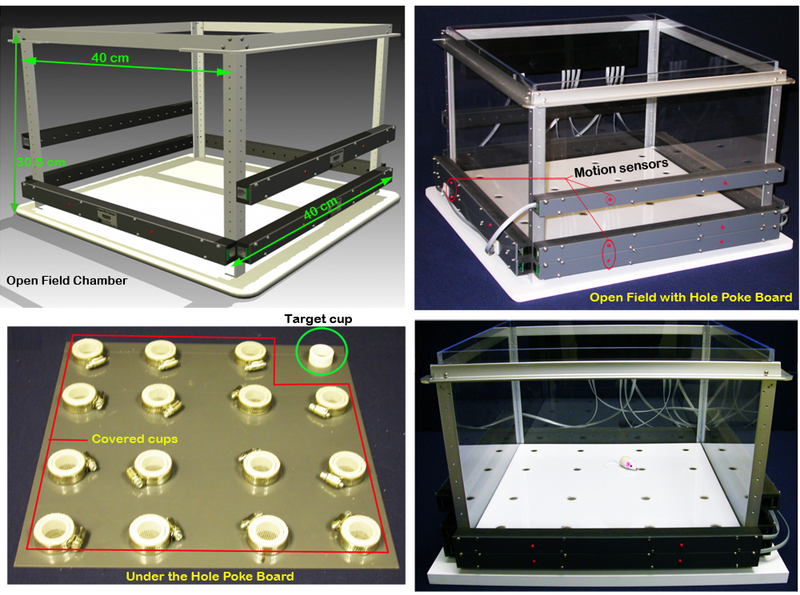 d. Light beam sensors are then positioned between the platform and the food cups. These sensors register the specific hole a mouse is investigating. e. A mouse is placed on the platform and allowed to investigate holes at will for 10 min (600 s). f. The duration and location of the query for each hole investigated is automatically recorded, and only visits to the target hole are rewarded. g. Rearing and nose poke activity measurements are extracted from automatically recorded data. h. In between mice, the surface of the arena is disinfected with 70% ethanol. HACTV: The total number of beam interruptions that occurred in the horizontal sensor during a given sample period. TOTDIST: Total distance traveled is not the same as "horizontal activity" counts. If the animal travels from one corner to the diagonally opposite corner, he will generate the same "horizontal activity" count regardless of path traveled. The distance traveled however, is dependent on the path that the animal takes. Hence, "total distance" is a more accurate indicator of ambulatory activity! The number indicates in centimeters the distance traveled by the animal in a given sample period. MOVNO: Number of discrete horizontal movements. Each time a break in ambulatory activity occurs for a period greater than 1 s, this variable is incremented by 1. This indicates the number of separate horizontal movements executed by the animal in a given sample period. Individual movements are separated from each other by a rest period of at least 1 s.
MOVTIME: As long as the animal is ambulating, this variable is incremented. If the animal is non-ambulatory for more than 1 s, this variable is no longer incremented. Thus it corresponds to the amount of time the animal was in ambulation during a given sample period. Does not include stereotypy time. RESTIME: It is computed as the difference between sample time and time spent moving. VACTV: The total number of beam interruptions that occurred in the vertical sensor during a given sample period. VMOVNO: Each time the animal rears up, this variable is incremented by 1. The animal must go below the level of the vertical sensor for at least 1 s before the next rearing can be registered. VTIME: When the animal activates the vertical sensor by rearing, this variable starts incrementing and continues to increment until the animal goes below the level of the vertical sensor. STRCNT: If the animal breaks the same beam (or set of beams) repeatedly then the monitor considers that the animal is exhibiting stereotypy. This typically happens during grooming, head bobbing, etc. Stereotypy count is the number of beam breaks that occur during this period of stereotypic activity. STRNO: This corresponds to the number of times the monitor observed stereotypic behavior in the animal. A break in stereotypy of 1 s or more is required to separate one stereotypic episode from the next. STRTIME: The total amount of time that stereotypic behavior is exhibited. MRGDIST: The distance (in centimeters) an animal travels while in the margin or corners of the cage. CTRDIST: The distance (in centimeters) an animal travels while in the center of the cage. CTRTIME: Time spent by the animal away from the walls of the cage.